I've been a member of the Porter Farms CSA for a few years now, splitting the membership with my friend, Jackie. I have to say that this is my least favorite time of year to be a CSA member. Our bags are full of cabbages and squashes, and neither are my favorite veggies. But the reason I joined the CSA was to stretch my cooking skills and try more veggies, and that definitely applies at this time of year. 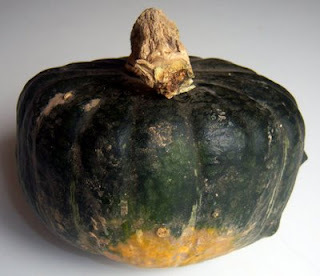 Last week's bag included this homely squash, a buttercup squash. I did some Internet searches for buttercup squash recipes, and I found that they can be used interchangeably with butternut squashes. That seems strange to me; the various winter squashes look so different that I'd imagine they'd taste different as well. 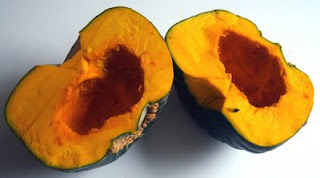 I cut open the squash and found a bright orange flesh, similar to that of a butternut squash. But the insides smelled like celery to me. Even though I have a butternut squash soup recipe I like, I thought this squash called for more of a savory approach, so I messed around with a squash soup with leeks. I served it for lunch with my friend, Marie, who said it was "fabulous." Of course, it was garnished with bacon, which makes everything fabulous! Cut stem off squash. Cut in half lengthwise. Scoop out seeds and discard. Preheat oven to 350. Place the squash, cut side down, on a baking sheet and bake until tender, about 40 minutes. Let cool. Using a spoon, scrape the squash from the skin. Discard the skin. Meanwhile, in a heavy saucepan, melt the butter over low heat. Add the leeks and thyme, and cook, stirring occasionally, until soft and browned, about 40 minutes. Stir in the stock and the squash. Simmer over moderate heat for 20 minutes. In a blender or food processor, puree the soup in batches until smooth. Pour the soup back into the pan and season with the salt and pepper to taste. If the soup is too thick, add some more chicken stock. 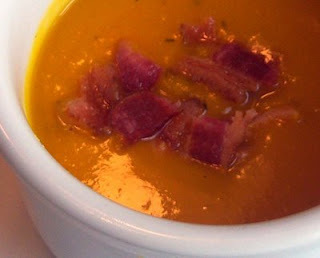 To serve, ladle the soup into bowls and garnish each serving with bacon. The baskets look so sorry at this time. How much longer will your farmer provide produce? I used to feel the same way about cabbage until I found a recipefor cabbage lasagne in a cookbook called "Tomato Blessings and Radish Teachings" by Ed Espe Brown. Basically you steam the cabbage leaves and layer them with any type of cheese and tomato sauce. Bake until bubbling. Really yummy! So did you like it? I love squash. A million ways. And cabbage well I just love poppy seed dressing on it. Cant get enough of it! And where do I sign up for a CSA here in Rochester? Mary, our bags are pretty full still. I think we've got one or two more weeks. Julie, sounds good! I'll have to look for that book at the library. Lori, yes, I did like the soup. As for the cabbage, I think I downloaded your recipe for cabbage with poppy seed dressing -- I've gotta try it. The Porter Farms CSA is out of Buffalo but they deliver to various spots in Rochester. There's a link in my blogroll. In fact, you can get a free guest bag to try it out -- send me an email (nywordsmith @ yahoo . com) and I can make that happen. I've heard there's a Rochester-based CSA called Windy Meadow Farms but don't know much about it. Is CSA like I person picks out the produce from a huge produce market for a two week period. The produce is then divided among the members each paying their portion of the cost. If it is, we did something like that in the 70s. It was always fun when it was your time to do the shopping. Also you could trade a friend some type of produce if you really didn't like it. It is a good way to try vegges you normally would not buy. I really enjoy pairing sage with bacon, so I wonder how that would work with the squash. I love squash and this soup sounds amazing!